A Page has been turned. The Canadian province of the Franciscan Order, Holy Spirit Province Saint-Esprit, is born. With this new beginning comes a new identity. 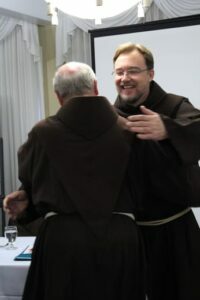 Friar Pierre Charland, the new Minister Provincial of the Holy Spirit Province. Five guests from the United States and from Ireland who had come to join us for this Chapter of Unions. Several guests and dignitaries made the trip to St. Albert, AB, for this occasion. Friar Peter Williams, ofm, attended in his capacity as Delegator General. As Delegator General, he had been appointed by the Minister General to accompany the Canadian friars through the preparatory period that preceded this Chapter of Union. 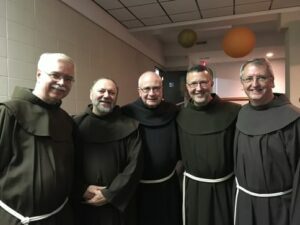 Several Canadian bishops and Ministers Provincial from the Franciscan provinces in the United States also attended. The theme of this historical event was “Go and Repair my House,” in reference to the words heard by St. Francis of Assisi when he prayed before the San Damiano Cross in Assisi. The Chapter of Union was an occasion to talk about practicalities, such as statutes, future orientations, and even finances. Most importantly, however, the friars spoke about the mission to evangelize in 2018. Friars want to meet all people wherever they are, but today, reaching out to young people is especially important. Friars Pierre Brunette from Lachute, QC, and Louis Geelan from Cochrane, AB. The new province counts 87 Franciscan friars aged 32 to 97 years. They live in Quebec (Montreal, Lachute and Trois-Rivières), British Columbia (Richmond, Vancouver, and Victoria), and in Alberta (Edmonton and Cochrane). Their ministry includes concrete works of outreach to the poor, those suffering from addictions, ministry in parishes, the preaching of retreats and the operation of a retreat house, school chaplaincy, and teaching at universities. 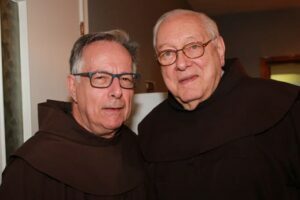 A ministry of special importance is the spiritual accompaniment of Secular Franciscan communities, which take the Franciscan charism into the larger Church and the world. The mother house of the new province and the home of the Minister Provincial and the location of his office will be in the friary “La Résurrection” in Montreal.